Sam Houston State University will launch its redesigned website on Dec. 18, with the goals of increasing web optimization, eliminating barriers for off-campus students, and updating the look and feel of SHSU’s webpages. The redesigned home page will include a new set of navigational headers, featuring “drop-down” menus, and other improvements. Within the streamlined header, links will remain accessible and will be “de-cluttered” to make it clearer and easier to use. The redesigned home page will also include a secondary navigation system that will appear next to the rotating images (and story links) below the header. Other elements on the home page will also be updated in terms of appearance and behavior. “Handy items frequently used by faculty, staff and students, including links to campus email, MySam, SamWeb and Blackboard, will be contained in a new group of drop-down items called ‘Campus Tools,’" said Elisa Crossland, director for online programs and communications with SHSU Online. The redesign is an “important first step” in SHSU’s Web Optimization Project begun earlier this year to address current challenges in SHSU’s online presence and to aid in university recruiting. 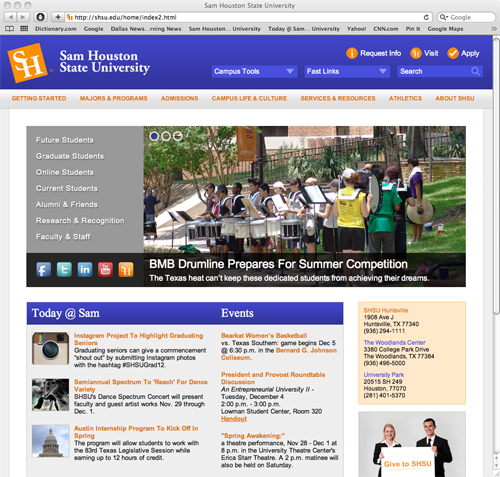 “Redesign of the university’s home page marks the beginning of the project’s effort to meet three objectives: to establish a high ranking for SHSU programs on search engines; optimize all SHSU websites to drive enrollment, beginning with online and graduate programs; and eliminate process barriers for students who cannot physically come to campus or engage during traditional business hours,” Crossland said. SHSU’s colleges of education and criminal justice will serve as pilots for the optimization and will serve as a model for the eventual optimization of other colleges’ sites. “An advisory board for the project has also been created, with representatives chosen by each college and university department,” Crossland said. “The role of the advisory board is to keep each college and department informed about ongoing project activities, provide the faculty/college/department perspective, and provide input on various activities, including development of guidelines for new college and department websites. “Through the entire process, the colleges will have the flexibility and autonomy they need—while the university’s overall goals are also being met,” she said. The Dec. 18 launch date was chosen with faculty and students in mind because it is the day after grades are posted and fall semester activities wrap up. Other improvements will take place after launch of the new home page. Details on subsequent steps in the project are available in a presentation prepared by the task force, which can be accessed at shsu.edu/web-optimization/. For more information about the project, contact Crossland at 936.294.2782 or elc025@shsu.edu or Diane McCormick, executive director of enrollment communications, at 936.294.1047 or dgm006@shsu.edu. The Lowman Student Center will celebrate the holiday season with food and Santa during their traditional open house on Wednesday (Dec. 5). The annual Holiday Open House invites faculty, staff and students to join the president’s cabinet for a university-wide celebration as classes begin to wrap up for the fall. The event will be from 10 a.m. to 1 p.m. in the LSC Ballroom, where participants can eat various holiday fares, prepared by Aramark, and take pictures with Santa. “The LSC has been hosting this event since the building was opened, we believe, back in 1964, and this event is the only one of its kind on campus,” said Chrissy Wieghat, LSC staff associate. “The LSC hosts this event for the entire student body, faculty and staff to come together to kick off the holiday season with food and music provided by the School of Music of the College of Fine Arts and Mass Communication,” she said. The event is co-sponsored by Aramark and the Barnes and Noble University Bookstore. For more information, contact Dan McDaniel, LSC director, at 936.294.1758. An art exhibition featuring SHSU students will literally be “Here Today, Gone Tomorrow” as students perform live for a one-night event on Wednesday (Dec. 5). “Here Today, Gone Tomorrow III” will be presented from 5-7 p.m. in the Gaddis Geeslin Gallery, in Art Building F Room 101. 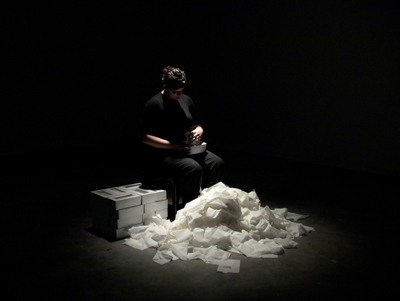 The exhibition will feature live performance art works, video and video installations from the students in assistant professor of art Annie Strader’s “Performance and Video Art” course, showcasing the “strongest work of the semester,” Strader said. Performance art is a medium about which many people, including very well-educated arts professionals, have misconceptions, according to Strader, and she hopes art aficionados will not only attend the exhibit but stick around to ask questions to student artists after the show. “My students are always a little scared when they sign up for performance and video class, and I think that is normal,” she said. “But through reading about performance history and theory and creating their own works, that fear turns into passion and knowledge. The exhibit will open at 5 p.m., with live performances beginning at 5:15 p.m. and continuing until about 6:15 p.m. Video works will be presented following the live performances. For more information, contact Strader at srs033@shsu.edu or 936.294.1322. Screenings will begin at 3:45 p.m. and 7 p.m. in Evans Building Room 105. The film is based on Charles Dickens’s story of a bitter old miser given a chance for redemption when he is haunted by ghosts on Christmas Eve. It stars Alastair Sim as Ebenezer Scrooge, Patrick Macnee as Jacob Marley, and Mervyn Johns as Bob Cratchit. “There have been over 15 film and TV versions of Charles Dickens’s famous story, but this one is the best,” Pease said. The film, directed by Brian Desmond Hurst, is 86 minutes long and is in black and white. 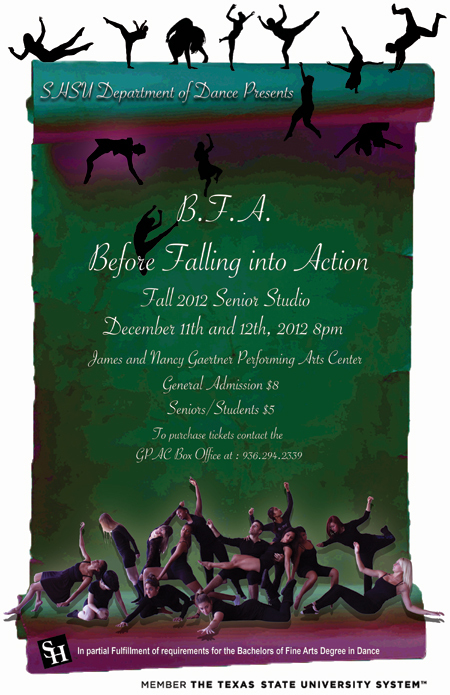 “Before Falling into Action,” an undergraduate concert produced by the seniors in the SHSU Dance Department, will premier Tuesday (Dec. 11) and Wednesday (Dec. 12) at 8 p.m. each day in the James and Nancy Gaertner Performing Arts Center Dance Theatre. Sixteen different works will be presented by seniors Alexis Anderson, Monet Angel, Leah Brown, Hannah Burns, Melissa Compian, Shannon Doerr, Kristin Edwards, Dominique Franco- Rivera, George Garcia, Jenny Gerena, Everest Guerra, Clarissa Hooper, Tawnya Kannarr, Tempestt Perrin, Jessica Rodriguez and Taryn Wilson. For the production, each choreographer was asked to push themselves in their choreographic works, giving the show a wide variety and many different levels of enjoyment, according to graduate teaching assistant Laura Harrell. The “BFA” concert is part of the semiannual senior dance studio event, held in partial fulfillment for students’ Bachelor of Fine Arts degree in dance. Tickets are $8 for general admission and $5 students. For more information, call the GPAC Box Office at 936.294.2339. Sergio Ruiz, director of keyboard studies and associate professor of music, will present a concert of works that wander through time during his faculty piano recital on Wednesday (Dec. 5). The concert will begin at 7:30 p.m. in the Gaertner Performing Arts Center Recital Hall. “The Wanderer” will highlight works by 18th through 20th century composers Domenico Scarlatti, Franz Schubert, Franz Liszt and Alberto Gianastera, all performed on the piano. A California native, Ruiz has been teaching at SHSU since 2004, during which time he has helped establish the university’s first Latin arts festival, Festival Inspiración, and has been recognized with SHSU’s Faculty Excellence in Service award. He has also been recognized as the 2009 Texas Music Teachers Association Collegiate Teacher of the Year. He has performed solo and chamber music concerts around the world, on Spanish-speaking radio broadcasts throughout South and Central America, and most recently in Ecuador, Columbia and México. Ruiz studied piano in Barcelona, Spain, as well as at Rice University, Cleveland Institute of Music and Santa Clara University. His teachers include Robert Roux, Paul Schenly and Hans Boepple. The SHSU physics department will present two more showings of its planetarium series program for the fall semester, including “The Great Space Race” on Friday (Dec. 7) and “The Nature of Science” on Dec. 14. Both showings will begin at 7 p.m. in Farrington Building Room 102. Written by high school students in Utah, "The Great Space Race" highlights the story of the U.S. and Russian space programs, from Sputnik to the ISS missions following the Columbia disaster. The following Friday (Dec. 14), Prokosch will examine “The Nature of Science” with a 22-minute program intended to communicate what science is and how scientists work. “The show features interviews with university science faculty as they discuss their work,’ he said. Both programs will also highlight constellations that can be currently seen in the night sky, including Pegasus, Andromeda, Cassiopeia, Cepheus and Cygnus, to name a few. For more information, contact Prokosch at 936.294.3664 or visit either the Planetarium WikiPage, at shsu-planetarium.wikispaces.com/, or the Planetarium Facebook page, at facebook.com/SHSUPlanetarium. The culmination of the collegiate experiences of 19 SHSU art students will be on display Dec. 10-15 in the Gaddis Geeslin Gallery. The Graduating Senior Exhibit, the capstone experience for art students, will feature works in all media from this semester’s Bachelor of Fine Arts degree candidates. “The quality of the work is very high this semester with many innovative approaches and intriguing ideas concerning a variety of topics including identity, notions of beauty in relationship to the body and personal relationships to land and nature,” said Annie Strader, assistant professor of art. Graduating seniors presenting their works include Sergio Barraza, Daniel Bertalot, Carlos Elarba, Lauren Martin, Ryan McNeely, Carlo Ramos, Jack Weidman, Grady Williams, Melly Wood and Joshua Yates. A closing reception will immediately follow the commencement ceremony for the art department on Dec. 15. Refreshments will be served. For more information, call the art department at 936.294.1317 or visit shsu.edu/~gallery. 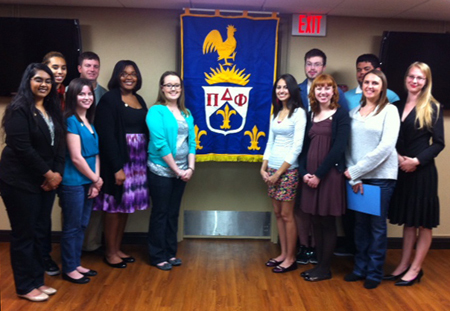 The Eta Iota Chapter of Pi Delta Phi initiated 12 student members to the national French honor society during its annual ceremony on Nov. 13. Those inducted include Chelsey Arnett, Jenny Bradfield, Joslyn Ceasar, Taylor Crane, Brittany Gregory, Ryan Johnson, Michael Kokot, Milah Moes, Rachel Main, Hever Penado, Jonathan Rowe and Elizabeth Yarberry. Established in 1906, Pi Delta Phi is one of the oldest national academic honor societies in the U.S. with 330 chapters in the U.S. and two related chapters in France. The organization is dedicated to recognizing outstanding scholarship in French, increasing the knowledge and appreciation of French-speaking cultures around the world, and stimulating and promoting the study of Francophone cultures. To be inducted as a regular member, students must have taken at least 18 hours of French, and maintain an overall grade point average of 3.0 and the same GPA in French. The ceremony was conducted by Eta Iota student president Laura Wood and vice-president Urooj Qureshi and was attended by local members of the society, SHSU faculty, family and friends of the initiates. For more information on the local chapter, contact the chapter moderator Shirin Edwin at 936.294.4732. 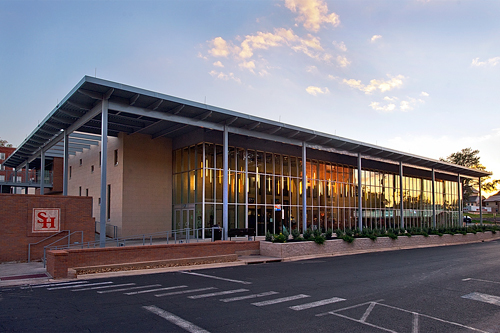 SHSU’s Old Main Market dining facility has received the 2012 Silver Rose Award from the Baton Rouge Chapter of the American Institute of Architects. The architect for the building was Tipton Associates of Baton Rouge. Of the 39 national and international projects entered into the design competition, only three were recognized at this level. “This is a design award to recognize outstanding architecture given out by the Baton Rouge, La., local chapter of the American Institute of Architects; in that respect it is not unlike other design award programs,” said Denise Neu, director of facilities planning and construction. “However, it’s a testament to the quality of what SHSU is doing,” she said. “An independent group of architects that aren’t necessarily familiar with our campus have ranked the facility as exceptional. In that respect it gives SHSU exposure to an expanded audience and ultimately sets the bar for other design teams." Projects are judged on their individual merit and granted at the discretion of an independent jury, which is composed of architects whose work and reputations have been established at the highest level of the profession. To view the winning projects and submissions, visit aiabr.com/events/_Rose.html. The University Communications Office is now collecting information on campus events for its fall calendar pages. Information collected for the Today@Sam calendar pages, at shsu.edu/~pin_www/calendars/, is used by various media outlets, as well as the Communications Office for news stories and releases.